Please put me down for 18.5C / 29.3mm. I may as well have a go even though i’m late. I’l have 20.1°C and 30.5 mm please. I had to increase my y-axis on my graphs to cater for the July average.. 21.3°C .. after one day, of course. Must be a fair chance of being above 20C by mid month. What are the CET records to the 10th and 15th for July. Tables of July forecasts posted. Consensus values are 18.2 C and 35.0 mm. Looks like the 10th and 11th are the best bets with the records relatively low and the forecast for averages close to 22C, on the 18z at least. Apologies, i should have said the rolling record to the 10th and 15th rather than daily records. I'm assuming we've never had the CET running at 24C. 1976 rolling averages exceed all others in July from 2nd until 24th when 2006 took over. The 23.78 average on 5th is probably the highest rolling average other than 1st or 2nd of any month. The warmest "month" of 31 days ending in July was actually in 1976 too, 21 June to 21 July = 20.22 C.
I would have to refer to some tables elsewhere but I think there was a warmer 31 day period in 1995 spanning parts of July and August. That's incredible, surpasses even my wildest thoughts. Wouldn't you be annoyed if it was 1976 and you had predicted 20+ and then that slide down to the high 18s showed up right at the bitter end? According to Gavin we are currently looking at around 19.4C to the 18th albeit i'd note that the models are iffy about some kind of breakdown around day 9. I am still relatively happy with my own prediction of 17.6C because i still think those expecting our settled spell to last have questionable medium term support in terms of background signals (yes we are moving to Nino overall but in the short to medium term there are some bearish signals from the tropics as we await the next wave) and so i expect that the second half will be a fair bit poorer than the first (not cool and wet but much more average) which should drag the CET down to the 18C mark. I will say however that based on the first half alone i do think this month deserves an 18C+ finish to mark itself as special rather than obscurely warm. No, your numbers are right, I was just quoting and adding 1976 alone. We are running 4.1 deg below that very hot July 1-5 period. The question is starting to become the driest first half of summer since.....? Speaking of (Rodger or Mr Data perhaps)..
What July CET do we need for the hottest May-July period on record. 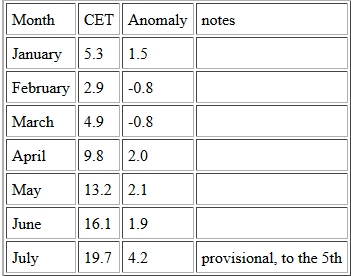 What July CET do we need for the hottest June-July period on record. What July CET to the 15th do we need to put ourselves in second behind 1976 for the second hottest first half of summer. Yes driest but not hottest 1st half of Summer, none of these 33/34c plus days, no rain here since May, pretty desperate stuff really. I think that we will see a different type of weather in the second half of summer, win the world cup in the final on the 15th and then the weather can do whatever it wants til Christmas! ... that is now 2006 (15.97) so to equal that we need (13.2, 16.1, 18.6). So 18.7 will bring us to 16.00. ... 1976 was second at 15.93, to equal that we need 18.5 C.
... that is now 1976 (17.85) so to equal that we need (16.1, 19.6). So a 2006-equalling 19.7 will bring a new record of 17.90. ... 2006 was second here at 17.8, to equal that, we need 19.5 C.
... okay, this is easier, June 1976 was 17.0, the first 15 days of July 1976 averaged 21.2, so the mean of those 45 days would be 18.4 C. To get to that value, the mean for 1-15 July 2018 needs to be 23.0 so I think that record is probably safe. Second highest such value was 17.9 C for 1826, to equal that we would need 21.5 C. Third place was 17.6 in 1846, to equal that we need 20.6 C.
My feeling it's going to surpass 1976 for England and Wales. June 2018 is already drier than June 1976 and latest Hadley figures says about 1mm up to 4th of July which even when combined with June 2018's figure is still less than what was recorded during June 1976. Despite how sustained we have been it does like all three records will probably be safe then due to the individual warmth of June 76 and July 06 making up for their less splendid May's.